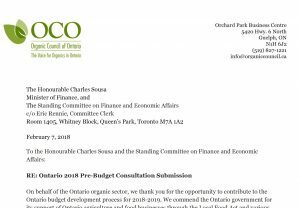 As the provincial government drafts its next budget for 2018-2019, the Organic Council of Ontario submitted a number of recommendations to support the organic sector. Two key proposals included passing Bill 153 and implementing a three-year, $9-million Organic Growth Strategy to assure the sector’s long-term growth. On behalf of the Ontario organic sector, we thank you for the opportunity to contribute to the Ontario budget development process for 2018-2019. We commend the Ontario government for its support of Ontario agriculture and food businesses through the Local Food Act and various funding programs in recent years. 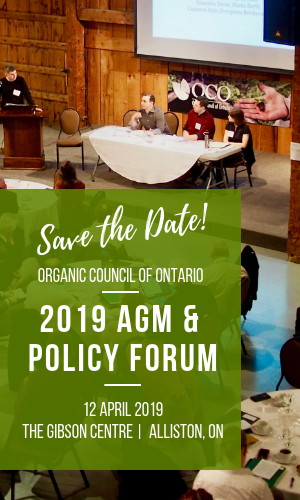 We also thank the government for their support of the Ontario organic sector over the past decade; the creation of the Foodland Organic brand, organic-specific risk management programs the appointment of the organic sector specialist, and funding of organic research and promotion. Organics are no longer niche. Organic food and beverage products are one of the fastest growing agri-food industries with over $81.6 billion in sales globally, over half of which are in North America. Canada is the fifth largest organic market in the world with $5.4 billion in estimated retail sales, and 2.6%of market share and growing fast at an average rate of 8.4%, but with some products such as organic poultry growing at 33% annually. Two thirds of Canadians buy organic products weekly. Organic product purchases are increasing in all income brackets and among all ethnicities. 88%of Millennials buy organic products. Organic makes more money & employs more people. According to the census of agriculture, organic operations have higher average operating incomes than conventional farms in their revenue class. For example, among farms with gross revenue over $1 million, organic farms had 18.9% higher operating incomes on average. They also employ more labour, with 23.5% reporting one or more year-round employees compared to 17% of conventional farms. 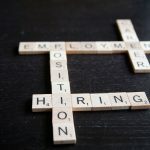 A U.S. study of organic “hot spots” (counties with higher than average organic business clustering) found that county poverty rates drop by 1.3 percent and median household income rises by over $2,000 in counties with high organic activity that neighbor other high-organic counties (OTA, 2017). Organic agriculture is a climate solution. Food system emissions are responsible for up to one third of greenhouse gas emissions, and agricultural production produces 80-86% of these emissions. Organic and ecological farmers have enormous capacity to reduce this impact.. According to the Rodale Institute, if all agriculture globally were to convert to the best organic practices, over 100% of annual greenhouse gases could be sequestered. Organic crop production for corn, soy, and wheat consumes 60% less energy on average (including 25% fewer global warming emissions) than conventional production according to a 2008 study by Pelletier et al. Organic systems also hold more total soil organic carbon on average than conventional systems, even compared to low- and no-till conventional practices, when measured to a depth of 1m from the surface (Cavigelli et al, 2013). A recent nine-year study of soil samples from over 1000 farms from across the U.S. demonstrated that organic soil samples held 13 percent higher organic carbon, 44 percent more humic acid, and one and a half times more fulvic acid. Humic and fulvic acids are important measures of soil carbon as they are considered a “stable” pool, and have lower turnover over time. They are also linked to higher soil fertility and beneficial soil structure. But Ontario is missing the organic opportunity. Ontario is Canada’s largest domestic market with an estimated $1.6 billion in retail sales of organics. And yet, only 1.6% of agricultural lands are under organic production, compared to Quebec at 3% and the US at 4%, we are falling behind. One quarter of Canada’s farmers are in Ontario, but only 19% of organic farmers reside here. In Quebec this trend is reversed: 30% of Canada’s organic farms are located there, while only 15% of all farmers reside there. Ontario is currently the largest importer of organic products in the country, with an estimated $297 million in tracked imports and only $56 million in tracked exports. That’s a significant trade deficit. And with no current provincial investment in developing the Ontario organic agri food sector, this trend will only be amplified. Quebec knows how to grow organic. So, why is Quebec able to capture the organic opportunity? Unlike Ontario, Quebec has always protected the value of the organic claim through strong regulation and enforcement, including on products traded intra-provincially. In 2015, the Quebec government also introduced a $9 million Organic Growth Strategy, that they have since committed to extending until 2022. So far, more than 300 farms in that province have received provincial funding for transition and certification costs. Now is the time to invest in Ontario’s organic sector. While organic businesses are having some of the greatest economic and environmental impacts in rural communities and the province, there is little dedicated government support for this growing sector in Ontario. Five other provinces have adopted provincial organic regulations and strategies to protect the organic claims made on products sold within the the province while Ontario lacks any regulatory mechanism to do so. There are currently no ministry staff solely focused on organic, no research, program or promotion dollars specifically devoted to it and no supports for conventional farmers wishing to transition to organic. Bill 153 represents a key step towards providing a level playing field for organic in Ontario. The Bill would assure consumers that all organic products sold in the province have been certified. It would also support the investment made by producers in achieving and maintaining organic certification. Ontario’s organic businesses face unique challenges to expansion and growth. Significant risks and stigma associated with organic conversion persist. Producers are concerned about the risks of transitioning to organic, access to affordable skilled labour and capital, and access to supports and advisors specific to the organic sector. A significant investment is needed to overcome these barriers and secure Ontario’s future as a global organic leader. Organic: A triple bottom-line investment. Ontario needs to invest in its organic sector now more than ever to capture a growing global opportunity, replace imports, improve rural livelihoods, increase climate resiliency, and to build public trust and food security for years to come. An investment in organic agriculture is an investment in all agriculture. We also strongly support the submissions from our partners: the Ecological Farmers of Ontario and Farmstart.